Original Editors - Alex Kent from Bellarmine University's Pathophysiology of Complex Patient Problems project. Acromegaly is a rare systemic disease which affects the entire body. It is characterized by a hypersecretion of growth hormone (GH) which the body is unable to regulate. 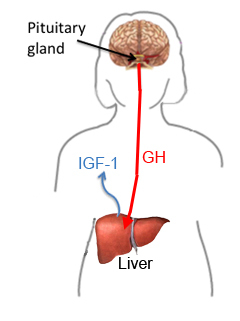 GH facilitates growth of muscles, internal organs, and bones, as well as stimulating secretion of its target hormone insulin-like growth factor 1 (IGF-1). , The extremely high levels of GH and IGF-1 which typify acromegaly cause tissue enlargement and metabolic changes that result in visible deformity as well as an increase in mortality. The disease often begins between the ages of 30 and 50, and has an insidious onset and slow progression, often delaying diagnosis until later stages of the disease. The prevalence of acromegaly is approximately 40-70 cases per million persons. However, new research suggests that the prevalence may be as high as 77 cases per million persons. The annual incidence of acromegaly is approximately is 3-4 new cases per million persons. Acromegaly affects many of the body's systems, and various signs and symptoms develop over a period of several years. They range from subtle changes to notable disfigurement. IGF-1, the target molecule of GH, enables many of the growth-promoting actions of GH; GH itself is also a regulator of mineral, lipid, and carbohydrate metabolism. Therefore the elevated levels of GH and IGF-1 which are characteristic of acromegaly excessive soft tissue growth, swelling of internal organs, and musculoskeletal, neurological, and metabolic comorbidities. Somatostatin analogs- somatostatin inhibits endocrine cells, including GH-secreting cells of the pituitary gland. Somatostatin analogs (SSAs) mimic the GH-suppressing effects of the body's own somatostatin. SSAs are one of the most common medications prescribed for acromegaly. There are currently three SSAs approved in the US: short-acting octreotride, octreotride LAR, and Somatuline Depot. Most common adverse events are glucose intolerance, and gallbladder and sludge stones. 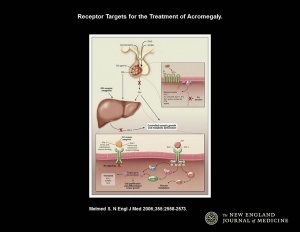 Dopamine agonists- leads to GH suppression in a portion of acromegaly patients. Interestingly, this medication stimulates GH release in healthy patients. Advantages of this medication are relatively low cost, oral administration, and no hypopituitarism associated with medication. However, the medication is only effective at lowering GH and IGF-1 to safe levels in approximately 10% of patients, and potentially causes cardiac valvular damage. Growth hormone receptor agonists- blocks the GH signal for IGF-1 production. More effective for patients with higher levels of IGF-1, and demonstrated a more favorable influence on glycemic control. Adverse events often associated with growth hormone receptor agonists are compromised liver function and reactions at the injection site. Oral Glucose Tolerance Test (OGTT)- glucose has a neuroendocrine suppressive signal that lowers GH. In this test, 75 g of glucose is administered with GH measurements at different points over a period of 120 minutes. The failure to suppress GH secretion to less than 1 microgram/liter is currently the standard for diagnosis of acromegaly. Magnetic Resonance Imaging (MRI)- the preferred imaging method when diagnosing acromegaly. An MRI of the pituitary gland is taken in order to look for any abnormal growth. It can help determine the tumor size, as well as compression of surrounding structures. Blood tests- blood may be used to measure serum levels of IGF-1 in addition to GH. High levels of IGF-1 have been used as a marker for acromegaly; IGF-1 is correlated with GH levels as well as the clinical manifestations of acromegaly. IGF-1 levels also tend to remain stable throughout the day, making IGF-1 testing a fairly reliable diagnostic tool. Generally, a diagnosis of acromegaly can be excluded if IGF-1 levels are within the normal range. 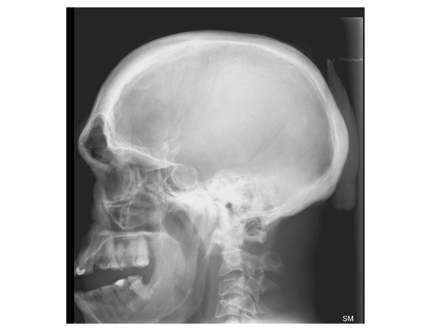 Radiographs- an x-ray of the skull can show bone thickening as well as enlargement of the nasal sinuses. Thickening of the carpal phalanges can be seen in x-rays of the hands. Computed tomography (CT)- this imaging method can be used to identify abnormal growths in the pituitary gland. Growth Hormone (GH)- in individuals without acromegaly, GH values are typically 0.1-0.2 micrograms/liter. There are, however, 6-10 bursts of GH secretion where levels of the hormone are 5-30 micrograms/liter. This may overlap with the values seen in patients with acromegaly. Growth hormone concentrations of less than 2.5 ng/ml are associated with mortality rates similar to the normal population. Thus normalization of GH levels is currently defined as below 2.5 ng/ml. The majority (99%) of acromegaly cases are caused by the proliferation of somatotroph cells in the pituitary which leads to a pituitary adenoma. Somatotroph cells make up more than half of the hormone-secreting cells in the ptuitary. The pituitary tumor causes an increase in circulating levels of GH. GH mediates anabolic reactions by binding to growth hormone receptors, creating docking sites for cell signaling proteins, and initiating the synthesis of target genes like IGF-1. This in turn increases the production of insulin-like growth factor 1 (IGF-1). IGF-1 causes metabolic changes and somatic growth, stimulating proliferation of cartilage, skeletal muscle and bone which ultimately lead to tissue enlargement. 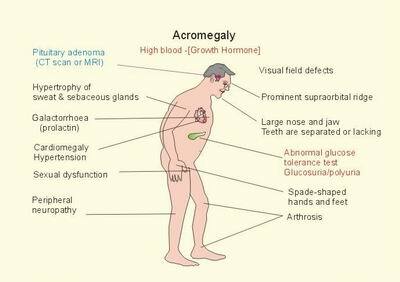 Enlargement of tissues and metabolic abnormalities cause the two to three-fold increase in mortality seen in acromegaly. Acromegalic cordiomyopathy- common features include biventricular hypertrophy, thickening of cardiac walls, diastolic dysfunction, limited systolic function, and heart failure with signs of dilative cardiomyopathy. Mitral and aortic valve dysfunction. Arrhythmia- linked to a combination of factors, including increased left ventricle wall thickness as well as late action potentials in the heart. Hypertension- due in part to increased plasma volume. Impaired glucose tolerance and diabetes mellitus- growth hormone counteracts the effects of insulin on glucose metabolism. GH also regulates the response of tissues to insulin; as a result excessive GH may be a causative factor in insulin resistance. Impaired lipid metabolism- acromegaly is correlated with lipid metabolism abnormalities.Studies have found serum triglyceride levels to be higher in patients with acromegaly. Mortality associated with repiratory disorders increased in patients with acromegaly. Increased incidence of sleep apnea. Barrel chest developed due to changes in morphology of vertebra and ribs. Ribs become elongated and vertebral bodies become enlarged and elongated, which impair inspiration. The goal of currrent medical management is to reduce the effects of the pituitary tumor by surgical resection, regulate the hypersecretion of GH and IGF-1 with medication, attempt to improve the numerous comorbidities associated with the disease, reduce the mortality risk, and maintain normal function of the pituitary gland. 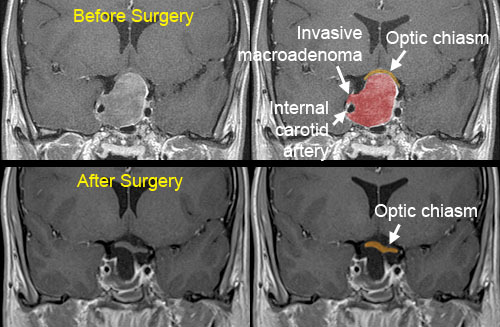 Pituitary surgery is often the first choice in acromegaly management because it can reduce hypersecretion of GH and IGF-1 and reduce the effects of the tumor on surrounding brain structures. The goal of <span id="fck_dom_range_temp_1301858332531_320" />surgical debulking is to resect as much of the tumor as possible while still maintaining normal function of the pituitary gland. Resection of adenomas in the pituitary gland is difficult due to the location of the pituitary gland and its proximity to important vascular and neural structures. As a result, surgery is most successful with an experienced surgeon; numerous studies have demonstrated that the outcome of surgical treatment of acromegaly is correlated with the level of experience of the surgeon. The specific actions of these medications are described in the Medications section. Involves the use of supervoltage irradiation. Less traumatic than traditional surgery. The radiation therapy is delivered in weekly doses spread over a period of six weeks. Approximately 50% of patients with acromegaly experience biochemical remission after radiation therapy. The radiation treatment may take years to have its full effect. 4F: Impaired joint mobility, motor function, muscle performance, range of motion, and reflex integrity associated with spinal disorders. 5F: Impaired peripheral nerve integrity and muscle performance associated with peripheral nerve injury. Individuals with acromegaly should be screened for changes in joint mobility, decreased exercise tolerance, and weakness. If an acromegalic client presents to physical therapy with unusual muscle weakness, they should be referred to a physician for a complete workup to look for neuropathies and inflammatory myopathies. This will help identify underlying causes which can be treated. Arthritis of several joints is often present in patients with acromegaly. In addition, carpal tunnel syndrome is seen in approximately 50% of patients with acromegaly, and there is a similar incidence of thoracic and lumbar pain in acromegalic patients. X-ray studies have demonstrated large osteophytes in the anterior longitudinal ligament and increased intervertebral space. A physical therapy program would work to promote muscle strength, mobility of the joints, and independence with functional activities. Adaptive equipment for assistance with activities of daily living may be considered depending on the severity of the disease. Exercise and ambulation are encouraged within the first 24 hours after removal of the pituitary tumor. Breathing exercises are indicated. However, coughing, sneezing, and blowing the nose are contraindicated. Monitor vital signs closely. Any change in vision, dropping pulse rate, or rising blood pressure could indicate an increase in intracranial pressure and should be reported immediately. The physical therapist should consult with the nursing staff to determine if blood glucose monitoring is needed during exercise. GH levels may drop rapidly after removal of the tumor and result in hypoglycemia. Failure to suppress growth hormone can also be seen in patients with diabetes, renal failure, hepatic failure, and patients with obesity or those on estrogen replacement. This could potentially lead to misdiagnosis. Acromegaly is associated with an increased prevalence of colonic diverticula: a case-control study. http://web.ebscohost.com/ehost/detail?vid=3&hid=127&sid=ddb0e071-4659-4d7d-8990-379b196f7b66%40sessionmgr111&bdata=JnNpdGU9ZWhvc3QtbGl2ZQ%3d%3d#db=cmedm&AN=20215398 (Accessed April 5, 2011). 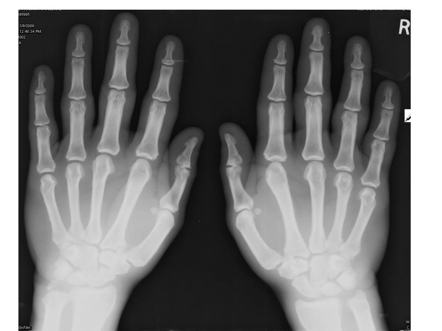 High prevalence of arthropathy, according to the definitions of radiological and clinical osteoarthritis, in patients with long-term cure of acromegaly: a case-control study. http://www.eje-online.org/cgi/content/full/160/3/357?maxtoshow=&HITS=10&hits=10&RESULTFORMAT=&author1=Wassenaar+MJ&title=High+prevalence+of+arthropathy+according+to+the+definitions+of+radiological+and+clinical+osteoarthritis+in+patients+with+long+term+cure+of+acromegaly%3A+a+case+control+study&andorexacttitle=or&searchid=1&FIRSTINDEX=0&volume=160&firstpage=357&resourcetype=HWCIT (Accessed April 5, 2011). Presurgical octreotide treatment in acromegaly: no improvement of final growth hormone (GH) concentration and pituitary function. A long-term case-control study. http://ck8zf4yc8t.search.serialssolutions.com/?genre=article&isbn=&issn=00016268&title=Acta+Neurochirurgica&volume=147&issue=5&date=20050501&atitle=Presurgical+octreotide+treatment+in+acromegaly%3a+no+improvement+of+final+growth+hormone+(GH)+concentration+and+pituitary+function.+A+long-term+case-control+study.&aulast=Pl%c3%b6ckinger+U&spage=485&sid=EBSCO:MEDLINE&pid= (Accessed April 5, 2011). Acromegalic axial arthropathy: a clinical case-control study. http://highwire.stanford.edu/cgi/searchresults?sendit=Search&pubdate_year=2004&volume=89&author1=Scarpa+R&title=Acromegalic+axial+arthropathy%3A+a+clinical+case+control+study&firstpage=598&andorexacttitle=or (Accessed April 5, 2011). ↑ 1.0 1.1 1.2 1.3 1.4 1.5 1.6 1.7 1. Vance M. Acromegaly: a fascinating pituitary disorder. Neurosurg Focus 2010;29(4):1. ↑ 2.00 2.01 2.02 2.03 2.04 2.05 2.06 2.07 2.08 2.09 2.10 2.11 2.12 2.13 2.14 2.15 2.16 2.17 2.18 2.19 2.20 2.21 2.22 2.23 2.24 2.25 2.26 2. Cordero RA, Barkan AL. Current diagnosis of acromegaly. Rev Endocr Metab Disord 2008;9:13-19. ↑ 3.0 3.1 3.2 3.3 3.4 3.5 3.6 3.7 3.8 3.9 3.Merck Manual Home Edition. Acromegaly and gigantism: pituitary gland disorders. http://www.merckmanuals.com/home/print/sec13/ch162e.html (Accessed March 11 2011). ↑ 4.00 4.01 4.02 4.03 4.04 4.05 4.06 4.07 4.08 4.09 4.10 4.11 4.12 4.13 4.14 4.15 4.16 4.17 4.Fleseriu M, Delashaw JB, Cook DM. Acromegaly: a review of current medical therapy and new drugs on the horizon. Neurosurg Focus 2010;29(4):E15. ↑ 5.0 5.1 5.2 5.3 5.4 5.5 5.6 5.7 5.8 5. Reid TJ, Post KD, Bruce JN, Kanibir MN, Reyes-Vidal CM, Freda PU. Features at diagnosis of 324 patients with acromegaly did not change from 1981 to 2006: acromegaly remains under-recognized and under-diagnosed. Clinical Endocrinology 2010;72:203-208. ↑ 6.00 6.01 6.02 6.03 6.04 6.05 6.06 6.07 6.08 6.09 6.10 6.11 6.12 6.13 6.14 6.15 6.16 6.17 6.18 6.19 6.20 6.21 6.Melmed S. Acromegaly pathogenesis and treatment. J. Clin. Invest 2009;119:3189-3202. ↑ 7.0 7.1 7.2 7.3 7.4 7.5 7.6 7.7 7.8 7.Del Porto LA, Liubinas SV, Kaye AH. Treatment of persistent acromegaly. J Clin Neurosci 2011; 18:181-190. ↑ 9.00 9.01 9.02 9.03 9.04 9.05 9.06 9.07 9.08 9.09 9.10 9.11 9.12 9.13 9.14 9.15 9.16 9.Goodman CC, Fuller KS. Pathology: implications for the physical therapist. 3rd ed. St.Louis: Saunders-Elsevier, 2009.